Lowry Grove: The park closed, the land's empty -- now what? 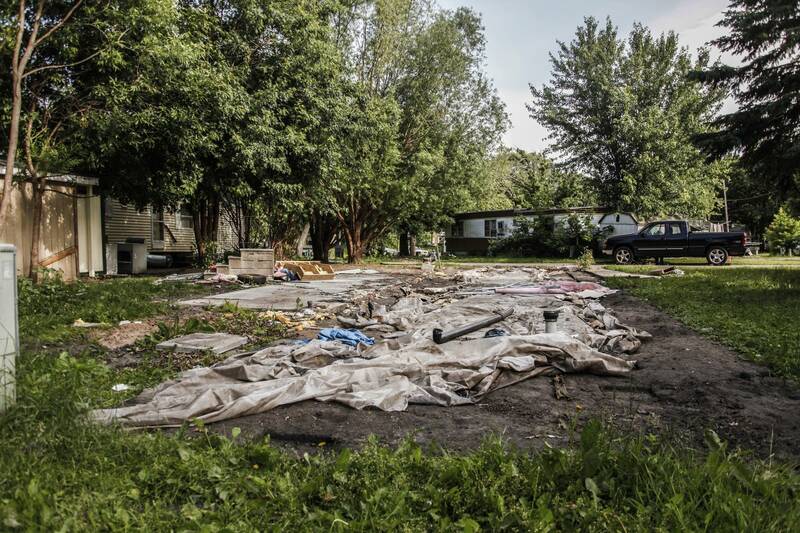 After more than 70 years in operation, the Lowry Grove mobile home park in St. Anthony, Minn., now sits empty. The last residents left in June, when the park shuttered. It was a mad scramble at the end to tow houses and track down cats and say goodbye to neighbors. The next step for the 15-acre site will be redevelopment: a brand-new set of buildings will rise where there were once mobile homes and RVs. But what those buildings will look like — and who will get to live there — is at the center of a new fight over the land. Tuesday night, the St. Anthony City Council voted to deny a developer's request to build more than 700 housing units on the site, citing concerns about livability and how the redevelopment might fit with the character of the neighborhood. Instead, the council wants half that level of density. Representatives of The Village, LLC, which owns the park land, accused the city of impeding their attempts to build affordable housing, which makes up a portion of the rejected plan. With the city council vote, the park may stay empty a while longer. According to Traci Tomas, vice president of The Village: "Less density creates an unfeasible development." It's the latest twist in the story of Lowry Grove, which has been marked by protests, heated exchanges and a lawsuit. For the last year, the park's story has exposed the high stakes and brutal realities that exist within a tight housing market. It began in April 2016, when park residents got a letter in their mailboxes saying Lowry Grove would be sold to The Village and closed for redevelopment. Shocked by the news, a group of residents rallied to save the park, relying on a little-used piece of Minnesota state law meant to protect the rights of mobile home park residents, who are particularly vulnerable when it comes to real estate deals. In mobile home parks, residents typically own their homes and rent the land on which they sit. When a park is closed, they can lose everything if their homes are too old to be moved. To address issues like this, Minnesota law gives residents the right of first refusal to head off park closures. If they can match a park's purchase price, they can buy it themselves to keep it open. Lowry Grove residents tried to do just that in the spring of 2016 by collaborating with Aeon, a nonprofit housing developer, to make a $6 million offer. The day after they submitted their offer, the park was sold to The Village. The sale ignited a lawsuit: Residents claimed they had made a valid offer that should have been accepted, and that the sale to The Village violated state law. Minnesota's attorney general agreed in a friend-of-the-court brief, writing that the sale of the park to The Village "shows subterfuge and a design to circumvent residents' rights." But the lawsuit didn't stop the park from closing. People in nearly 100 households were forced to leave. For them, many of whom were low-income residents, Lowry Grove had been something of a housing unicorn: A neighborhood on mass transit lines, in a top-performing school district, with lot rents of $450 per month. A comparable situation is difficult to find in the current market. Since 1991, no new mobile home parks have opened in the Twin Cities and half of the parks in Hennepin County have closed. After the closure of Lowry Grove, residents scattered — some to parks in New Brighton, Fridley and other suburbs, and others to the homes of relatives or public housing in Minneapolis. This summer, after months of back-and-forth through the courts and mediation, The Village and the Lowry Grove Residents Association reached a preliminary settlement in the residents' lawsuit. The exact terms are confidential, according to a joint statement released by all the parties, but they made two elements of it public. First, The Village agreed to sell 2.1 acres of land at the site to Aeon, which planned to build affordable housing on the site — enough to offset the number of homes lost when the park closed. This was key for the residents who brought the suit: They wanted to ensure that affordable housing remains a part of Lowry Grove's future. Second, The Village agreed to make a "six-figure donation" to a newly established charitable fund called the Lowry Grove Resident Support Housing Fund. The fund will be managed by an outside party not involved in the litigation, and it will distribute funds to former residents based on criteria and processes that haven't yet been established. The settlement — and the affordable housing it promised — is contingent on The Village's ambitious plans for the site. And making those plans a reality requires the St. Anthony City Council's approval. Tuesday night, that didn't happen. Instead, St. Anthony city manager Mark Casey proposed a 25 unit per acre cap on the redevelopment — roughly half of what The Village's plan would require. The Village had proposed building 712 housing units — a mix of market-rate apartments, senior housing and affordable housing, some several stories tall. The complex would drastically change the look of southwest St. Anthony: The Lowry Grove site is mostly surrounded by single-family homes. At Tuesday's city council meeting, representatives of The Village presented their plans for the site. They were followed by neighbors who oppose the taller buildings and higher density housing, at roughly 40 units per acre. People voiced concerns about increased traffic, storm-water runoff and pedestrian safety. Tensions ran high. A representative for The Village went as far as to say that none of this would have ever happened — the park sale, the protests, the hundreds of people relocated — if it had known the city council would hold them to 25 units per acre. William R. Skolnick, speaking on behalf of The Village's president, Brad Hoyt, said: "We would have walked away." The Village claims the density cap is in direct contradiction with earlier conversations the company had with St. Anthony about the future of the park. They claimed Casey, the city manager, told them "the more density, the better" before they even bought the park. They accused the city of changing their stance on density, and implied that by rejecting the proposed redevelopment, St. Anthony is failing to honor its commitment to affordable housing. St. Anthony mayor Jerry Faust said the city's commitment to affordable housing remains, but "this specific proposal does not meet community needs." He added that he hopes the conversation around affordable housing in St. Anthony continues. For now, the park will remain empty while The Village considers its options. The density cap could make the redevelopment project economically unfeasible, according to The Village's Traci Tomas. Bill McConnell, a former Lowry Grove resident who now lives in public housing, said he would like to one day move back to the neighborhood if affordable housing becomes available. But after the vote, he wasn't hopeful. By the end of Tuesday's meeting, Tomas said the company has no timeline for a redesign of the site.